Cook frozen beef patties in a frying pan with both health and safety in mind. Using a nonstick pan to fry the patties means no extra unhealthy fats are needed to keep the burgers from sticking to the pan. When buying frozen beef patties, choose products that are 90 percent lean or higher. Since anyone can contract a food-borne illness -- and certain groups of people such as pregnant women, children and anyone with a weakened immune system are especially susceptible -- cook the patties to a safe internal temperature to prevent illness. After the patties are done, take it a step farther and remove any excess grease to keep the burgers as healthy as possible. Preheat the skillet over medium heat on a stove top burner for five minutes. 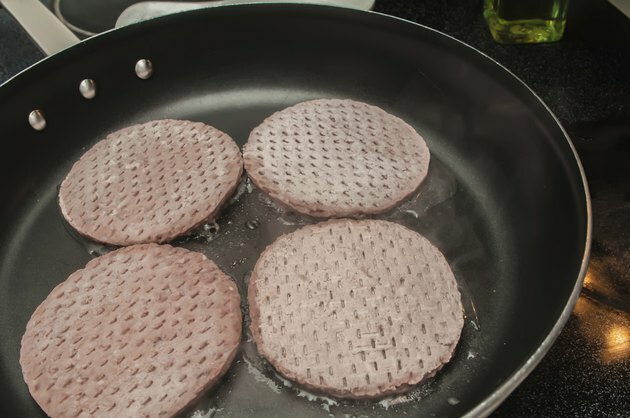 Place the frozen beef patties in an even layer in the skillet. Cook the frozen beef patties for about six minutes, or until they are completely brown on one side. Flip the patties with a spatula. Do not use a fork, since it might pierce the meat and release the juices that keep burgers moist. Insert a meat thermometer into the middle of one of the burgers. Cook the patties on the opposite side for another six minutes or until the opposite side is brown and the thermometer registers 160 degrees F.
Remove the patties from the skillet with the spatula and place them on a plate lined with paper towels to drain any excess fat. Blot the tops of the patties with paper towels to remove fat from both sides. Do not overcook the beef patties as the meat becomes tough and dry. U.S. Department of Agriculture: Is It Done Yet?